Aerial view of Launch Pad 39A at NASA's Kennedy Space Center in Florida. NASA has chosen SpaceX to negotiate a lease for use of the historic complex to launch the company's rockets. NASA has selected Space Exploration Technologies, better known as SpaceX, to lease a historic launch pad for the company's commercial rockets. The space agency announced Friday (Dec. 13) that it is beginning negotiations with SpaceX of Hawthorne, Calif., to take over exclusive use of Launch Complex 39A at the Kennedy Space Center in Florida. NASA used the pad for decades to send astronauts to the moon and later launch space shuttles into Earth orbit. SpaceX, led by billionaire entrepreneur Elon Musk, was one of two private spaceflight companies vying for the use of Launch Pad 39A. Blue Origin, founded by Amazon.com chief Jeff Bezos, had proposed using the launch complex as a multi-user facility supporting other rocket companies, including United Launch Alliance (ULA). SpaceX proposed to use to use Pad 39A for its own future launches. The company is currently contracted by NASA to launch its unmanned Dragon capsules to resupply the International Space Station and is currently vying for the agency's business to fly astronauts to and from the space station beginning in 2017. SpaceX has previously said it was considering use of Pad 39A for launching larger models of its Falcon rocket. NASA chose SpaceX after the Government Accountability Office (GAO) denied a protest filed against the agency by Blue Origin in September. Blue Origin had raised concerns about the competitive process NASA was employing in its attempt to lease use of Launch Complex 39A (LC-39A). Blue Origin had argued that the language in the agency's Announcement for Proposals (AFP) favored a single-user approach over a multi-user pad. The GAO disagreed. While the protest was still underway, NASA was prohibited from choosing a commercial partner for use of 39A from among the proposals it had received. However, while the GAO considered its decision, NASA continued evaluating the proposals in order to be prepared to make a selection when permitted to do so. First and last launches, for now: The Apollo 4 Saturn V liftoff (left) and STS-135 space shuttle launch were the first and last to leave Launch Pad 39A in 1967 and 2011, respectively. After the GAO rendered its decision Thursday in NASA's favor, the agency completed its selection process. NASA notified SpaceX and Blue Origin of the decision on Friday. NASA said it will begin working with SpaceX to negotiate the terms of its lease for Pad 39A. During those talks, the space agency said it will not be able to discuss details of the pending lease agreement. Pad 39A was one of two large launch complexes built in the 1960s to support the Apollo program's Saturn V rocket launches to the moon and Saturn IB flights to the Skylab space station. Both pads were later modified for launching space shuttles to deploy and service satellites and build the International Space Station. Pad 39A's twin, Pad 39B, was stripped of its iconic launch support towers in 2011 to enable its use for possible future commercial and government launch vehicles. 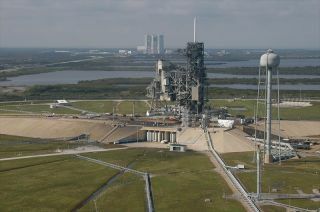 Launch Pad 39A, which supported 92 launches since November 1967 — 12 Saturn V rockets and 80 shuttles — was initially set to support NASA's new heavy-lift rocket, referred to as the Space Launch System (SLS). Budget constraints however, caused NASA to consolidate its future launch pad needs at Pad 39B, leaving Pad 39A without a purpose. And without the funding to modify or maintain it, NASA officials said earlier this year that the agency would have no choice but to abandon Pad 39A in place unless a commercial user could be identified. As the selected lessee, SpaceX will be responsible for the financial management and technical operation of Pad 39A. In addition, the company will be required to maintain and provide NASA access to components on the pad for their historic preservation, including the gaseous oxygen vent arm at the top of the pad's fixed service structure and the emergency egress bunker, or "rubber room," located under the pad's surface. Earlier this year, the space agency lowered and removed the pad's orbiter access arm. The arm, which is capped by the "white room" through which the astronauts entered the space shuttle, was placed into storage for future display.